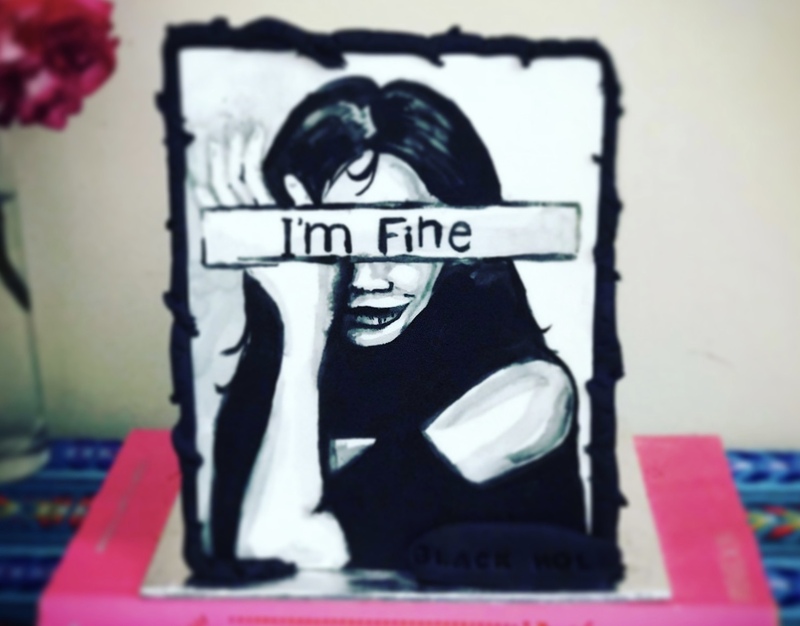 Depressed Cake Shop takes on mental health stigma, one grey cake at a time. The stats – the average, that is – for the number of people to suffer from a mental health problem is 1 in 4. Worse, in some geographical and demographic areas, this drops to 1 in 3. Look around you. How many people do you see? Which of them are tussling with depression, bi-polar or a personality disorder? What about your friend groups? Do you know who is struggling, who’s hiding behind a smile? It could be your sister, your colleague, the person who makes your morning coffee, it could be you. Hiding behind a brave face is common. Who wants the world to know that you frequently fall in a deep, black hole where every positive thought or fact is cancelled out by self loathing, a sense of uselessness and despair? Or that at times even you don’t understand why you said or did that thing that upset everyone. And people get so uncomfortable talking about it – it still has a taboo element about it. Talking about it is tainted by fear and misunderstanding, and so it’s easier not to get involved. I don’t know why mental health issues have become so common, why it has an epidemic feel about it. I’m no expert and I have no research to back up my thoughts but I may not be too far off the mark in thinking changes in our societies – western societies – are big contributors. Family structure and dynamics, technology, all the tentacles of social media, changing (dying?) sense of community and belonging, the state of the world in general, reporting of news in an in-your-face, technicolour, HD version of events. Personalities, experiences, reactions. Maybe all of them, maybe none – I don’t know for sure. What do you think? The thing is, people ARE depressed, they ARE suffering and their symptoms are difficult for the rest of us – the friends, families, colleagues, onlookers – to understand and deal with. The taboo is still there. The childhood gesture of circling a finger around an ear to indicate someone is cuckoo, loco, crazy, is still in our minds. We’re not sure how to support the people we know need our help and understanding. I’ve tried to be a support person for someone close to me over a long number of years, when I can, when I knew support was needed. In the beginning I wanted to understand where the depression came from, what caused it, was there an event or a trigger that would help me “get it”? Now I know there’s far more value in just being there, talking, listening, caring. I got over the fear of saying the wrong thing in the face of a blinding despair during the black hole moments. I learned what was needed to get them through that moment, and sometimes to help plan ahead. I feared for that person, but I think I can see they can work on the parts of their lives that they can change and manage the bad parts with support and care. And I’ve had – got – my own story. I mean, don’t we all go through rough times at some stage? As a side-hustle cake decorator I spent a lot of time scouring books and the internet for cake inspiration. 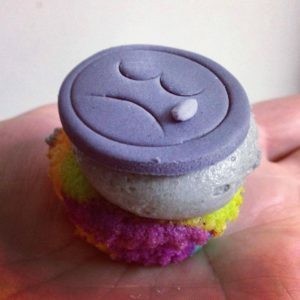 When I landed on a blog about a one-off awareness campaign to change the conversation about depression and mental health issues using grey cake, I was hooked. Discovering there was grass-roots movement in the USA and UK, I signed up to the Depressed Cake Shop (DCS) facebook group and started planning how I could set up a pop-up in my town. The Depressed Cake Shop premise is simple. Gather some bakers, have them make cakes and sweet treats of any kind and decorate them entirely in grey icing. Set up a pop-up shop somewhere with lots of foot traffic, and sell the cakes and donate it to a mental health help organisation in your region. That’s it. The variations in cake decorations and pop-up models are endless. This is the story of how a low-population, agricultural-based region went with their model. Gathering some ideas for grey cake decoration together, I hawked the Depressed Cake Shop concept to anyone I could find in the mental health area in my town. By my third or fourth phone call I found Louise, whose organisation worked in community care, and who loved the idea. She provided the means, the professional support, the flyers and information and I brought volunteer bakers and a load of grey buttercream! We set up inside the entrance to the local shopping centre and gave out free cake in exchange for a quick chat and an information flyer about where to find help in the area. Louise later told me it was among the most successful programs for exposure and getting information out into the community they had ever delivered. Winning! Last year, I did the same thing all over again, this time with pop-ups in three regional towns. We iced hundreds of cupcakes, baked huge cakes, packed biscuits and slices and sent them out with boxes of flyers and fridge magnets for support contacts. We ran out of cake and we ran out of flyers – people recognised the event from previous years and were more inclined to stop for a chat. The mental health professionals LOVED it and are planning a second Depressed Cake Shop pop-up later this year. People are talking about our grey cakes and the message they deliver. And the icing on the cake – sorry, bad cake pun – has been the people I’ve met through making grey cakes. The network of bakers and makers across the globe, who are all on their own missions to destigmatise mental health illness with amazing events and supporters. The high profile cake businesses from cities here in Australia who are really keen to see more Depressed Cake Shops popping up and spreading the word. The local professionals working the in the health industry who can’t believe how successful the events are in getting information and awareness out there. All through a simple concept of using grey cake to change how we think and talk about mental health and depression. We’re in planning mode again, with four pop-up shops in as many towns in our region set for APril and May 2018. Could you host a Depressed Cake Shop pop-up? You can find ideas at the official blog, on instagram or at facebook, or by contacting me by email to get more information. Grey cake. It makes a difference.